before starting … if you are fairly into boardgame and you are a fan of game of thrones … do yourself a favor and buy this game… it is a must…. No… this game is not easy to learn … i often had to spend a lot of time explaining the rules to new players … and it s always taking forever… and even while playing you have to explain it back or add some other things … buuutt during the game most players will start to understand the mechanics … and by the end of a full lenght game , most players will start having a good feel of it and start thinking of their mistakes and what they can do next game to not get screwed… But you will need a good 30min to explain the rules and then a 3hours game or more to have everyone on board … in fact i think most people will not experience most of the game before playing at least 2 full games… after that my friends , it will be money ! so dont scare away ! it is still a lot of fun ! in fact , i think it might be one of the greatest game i ever played. I find it best to play over and over with a group of friend that know the game… i often do a thematic >game of thrones> night were everyone is ready , with already some strategies in mind…. this is when the magic starts. the board is a little too big , it takes a full table to set up , but its nice… you ll find well made cards and all kind of stuff, its pretty packed … the only thing is that i wished they made the box to keep that in order , cause it gets messy .. instead its basically nothing but some plastic bags … yet ! the components are amazing , oh yea the art is outstanding…all in all very thematic. the mechanics are all simple on their own , but it feels like a lot of mechanics are in place in the game wich make it a little complex at first … but with a little time it becomes very easy…This game has almost NO LUCK …and NO DICE ..
all of this make it so the game can be long if played with slow player … indeed the game often take about 3-4hours…***note : be assured, it is very rare that a player is totaly killed … most of the time , a player might be losing big time , but still has alittle area of resistance, just so he can continue to hope to make a comeback(wich does happen), continue being interesting to be allied with and/or change a battle outcome/or the winner of the game .. This game is great .. i dont play it often cause it takes a lot of time , and aslo need some experience players … but it is one of the most interesting and complete game… it is rich , it is mindblowing , and at the end of the day , it really feels like you are moving armies around , like you would on a RTS but on a real table.. it is one of those games that can be a lot of fun , it is the kind of game you will want to play often in spring (during the game of thrones season) but it is not a game for kids or casual gamers ( unless they are GOT fan…?? ). still i would recommend having it in ur shelf for those time , when you want to kick your friend s *ss. This game is heavy for a reason – it knows what it is and it does it’s thing well. What is A Game of Thrones: The Board Game? This is a heavy area control political game about conquest in George R. R. Martin’s beloved setting “A song of ice and fire.” Players take control of one of the Great houses of Westeros in their quest to destroy their enemies and gain control of the land while fighting the constant wildling attacks in the North. The first to conquer 7 castles or fortresses is the winner. Alternatively, if the time runs out a winner is determined by other criteria. The rules are kind of complicated and the rulebook isn’t great. Fantasy Flight Games have an online video on their YouTube channel that doesn’t do the job either. You really need an experianced player to explain things in 20 minutes, otherwise expect some headache. It’s worht it, though. This game has a lot going on – you command armies, issue orders, attack, support other players, manage the food for your armies, build ships and siege weapons, etc. Diplomacy and co-operating with different players at different times is a must. You will betray them at the first opportunity, though. Keep in mind, that this is a ruthless game. You will betray and get betrayed. I’ve seen people stop talking to each other for days over this game. And that’s the beauty of it – indeed “you win or you die”. The game recreates Westeros very faithfully. The map is great and the character art is brilliant. When they announced the 2 edition a few years back I trambled in fear that they’ll tie the game to the tv show and worst case scenario – they’ll use stock footage from the show on the cards. My fears were in vain – all the art is interesting and original – it shows different interpretation of the characters and I just love them. Though mostly everything is great (this is a FFG game), some things are really weird – like the board. It folds in an non-intuitive zig-zag fasion that makes it super easy to break. I’ve seen a lot ot torn GoT boards. Not sure why this is. Tokens are also on the cheap side – they are made of plastic that imitates mother of pearl. I’d really prefer wooden pieces, but this is a really minor complaint. Other than that, components are great. This game is all about interraction. You fight each other, you help each other, you betray each other. There is an interesting bidding mechanic that could buy you the right to break ties, be better in combat, or switch up one of you orders. Needless to say, you can only get one or two of those, but most of the time you’ll get none. How much fun you could have with this game is very dependant on the people you play with. Westeros fans, area control fans, power players – they will love it. A group of good friends comfort with the idea of screwing each other bad will love it. However, avoid playing it whith whiners and people who hate to lose. It might end ugly for them. I’ve seen a couple break up for a day after a GoT. Yes, it is that engaging and people are that passionate about it. This should say enough about the quality of the game. Highly recommended. …And its me! Off with yer heads. 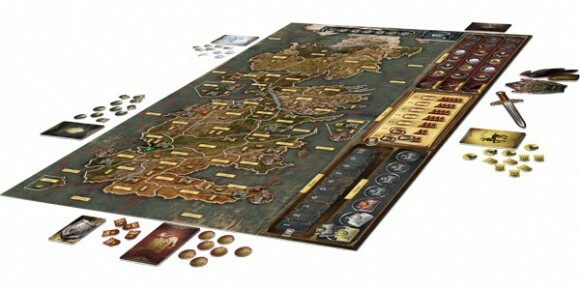 Game of Thrones: The Board Game was the board game that launched me in world of board gaming. This game is strategy game (3-6 players) with all that comes with the genre, from troop movement to supply management. You assume command of one great Westerosi families (Starks, Lannister, Baratheon, Tyrell and Martell) and one not so great one (Greyjoy) in hopes to place your dynasty on Iron Throne to rule the 7 kingdoms. Your goal is to capture territory, that is unoccupied or occupied by other player, until you have 7 castles and you win (or as it is more likely time runs out after 10th round). Castles and Strongholds give you more troops, which is what you want and need to win. However its not that simple, you also need supplies to feed your troops and you need influence to get ahead of your peers in court. All this you can find from territories you might have. Controlling your area and occupying more at same time is tricky in this game and it makes it great, you can’t prepare for everything. Great example was when I backstabbed my ally in very final turn so I wouldn’t have to share victory, for I will not share what I can rule alone. This game does bring the world of Westeros as we love it from books and the HBO series. However please note this is not something for everybody, if your friend/family gets easily angry and hurt… Get this game, but don’t play with them. Gameplay is about expanding your domain by military force, but your armies are limited by amount of supply you have available currently and your plans might go down the drain because somebody gets to play their orders before you. This game is stone foot where phrase “Plan that can’t be adjusted is no plan” stands proudly. Turns start by pulling up three Westeros cards, which determine events of the land, like recruiting more troops or bidding for your position in court (I come back to different court standings later) or might be Wildlings decide the North is too cold for them and attack the wall. When Westeros cards have been resolved and limitations brought by them have been acknowledged starts the planning phase. This phase is the core of the game, you place orders for all your armies, troops and navies. Orders follow, marching (or attack), support, defend, raid and consolidate power. Marching and defend are self-explanatory, but other need a bit opening up: support gives troops assigned this order right to join to battle (doesn’t have to be your own battle) as defending or attacking support for main force. Consolidate power gives you extra influence you can use to bid on various different situations or control the land without occupying it with troops. Raiding units can remove adjacent location orders from enemy player (not marching or defending order). All the orders have special versions that require certain standing on the right court track, higher you’re more you can play special orders and these are important. Orders are placed face down on board where there are troops and turned around all the same time when everybody has placed the orders. Then orders are resolved by doing Raid first and then marching, leaving consolidate power as last. Fighting in game comes down very simple: amount of the troops and their type (4 kinds: footmen, knights, siege tower and ship), supporting troops and their type, possible modifiers in orders and house card (representing the General his/her abilities), lastly Valyrian steel blade (which you gain by standing top on Fief court track). Then counting the results and as I advice adding for both player the fortunes or war-card to make it more interesting. Lost player retreats and casualties are counted. Simple but its fun. Turn ends and new begins. Now, occasionally there comes a card that tells you to bid on three court tracks. These represent intrigue in the game and each one gives benefits of different value. First is Iron Throne track which determines turn order of players, this is pivotal for your plans to come together, first player gets to decide stalemates (except in combat). Second if Fiefdom track which determines military prowess and winning order in combat stalemates, first player on this track gains once per turn +1 to combat as Valyrian steel blade. Third is King’s court which determines how many special orders you can play, first on this track gains right to chance one of his orders after revealing orders or look at top of Wildling deck. Bidding on these three tracks happens in order and every track requires own bid. For bidding influence tokens are used, which is the games currency. This game requires some learning, but nothing that you can’t handle. However it requires more so attention to details and ability to keep all the strings firmly in your hand, losing the initiative in this game is devastating. If you like playing Total War style computer games, this is board game for you. GoT board game has potentiality of being every bit cruel as the source it draws its inspiration. Amazing competitive gameplay! Work with you neighbors, make alliances, push forward unto the breach, and ultimately betray your friends in the end as you push towards victory! In the end only one can claim the Iron Throne, so win…. or die. There are several mechanics to this game which can make it seem a little overwhelming to first time players, but any group of gamers who enjoy a cutthroat game will love GoT. So muster your armies, develop a superior supply chain, conquer some castles, vie for favor of the people. Do these better than the others and you can claim your place in Westeros history! Game of Thrones (2nd Ed.) is an excellent game that provides my gaming group hours of fun. The game is great to play with 3 to 6 people, but in many cases works best with four. The Feast for Crows expansion is the perfect example. The expansion is for four players and it changes the base game to a very different type of game. The FFC expansion is based off of the timeline in the Game of Thrones novels. The expansion adds a seventh house the game in House Arryn. Building upon the same rules used for the game, the FFC expansion adds various objective cards which give the players goals to accomplish to earn victory points. For example, an objective card may give you one to three victory points for taking and holding certain territories. If you like A Game of Throne but haven’t played the Feast for Crows expansion I highly recommend it as a new,fresh way to play an already great game. This board game works great as a game as a whole. Although plotting to take over land and defeat your opponents, you must all work together to defeat the wildlings who will attack every so often. This aspect adds a level of comfort as you all have external forces to think about. That being said, the game isn’t overly complicated to understand (definitely watch the 20 minute youtube video which explains most things) however like with most games the finer details must be sought after in the rule book or online. We played a three-player variant which meant that half of the board wasn’t actually able to be used (which we didn’t know until half-way through; please be aware!) and it only took us a couple of hours to set up and finish an entire game! For those who have played the card game, you might be disappointed in the lack of characters however the detail of the map and locations should tickle that part of your fancy. In conclusion this is my favourite of all the Game of Thrones games because of the Risk elements plus the external force of the wildlings. for this year I think this is the best politic , back stabbing, and negotiaton game .. If you wonder why the game is taking so long time to play with, it is because of the negotiation and interaction between players which is the main part of this game. and setting up taking long time.. I had a great time playing with my group that gets together every week! First, I’ll start off with the board itself and all the cards, tokens, etc. The board is truly a piece of art, same with the cards of the game! It’s really nice to get a board game that looks amazing instead of looking like a it was just thrown together! Really love the quality of every piece included in the game! There is a pretty steep learning curve at first that is very time consuming. The play isn’t difficult once learned but it’s definitely a lot to get through before you can start playing. I like that there isn’t any dice thus, this game is more about strategy then luck! In the game you choose a house (certain houses aren’t used depending on how many players) and then try to obtain 7 victory points or have the most victory points by the end of the game (10 rounds). I won’t go into complete detail cause that would take a lot of space up. Basically you take over areas on the map and depending on what you take over helps you in different ways. I like that they incorporated sea and ships that way it aids you in traveling far distances pretty easily if you control multiple connected sea areas. To me it seems the replay value will be down a little because the event deck sizes are so small, you’ll see the same cards every game. I’m not too worried about that but I know that could be a concern to others. Overall I really like this game and would recommend it to any GOT fans that also enjoys strategy games! But she hated this game. Too many times we had to stop to check rules, explain concepts and undo or redo actions. I’m not joking when I say the first turn in our 4 player game took 45 mins. The steep learning curve is not for the faint hearted, but once you get into a really deep game, with players who know the rules, there’s few better games for atmosphere, theme and mechanics. The opportunities to really screw over your fellow man are almost limitless. Brilliant game everyone should try once. Just get over that learning hump. This game captures the feel of George Martin´s world perfectly!! You can make alliances, treats and promisses, but they are all feable and when you least expect some one is going to put a knife in your back, or the dagger will be in your hands!! The mechanic of this game is very well rounded, and is very coherent… you must control lands that provide you with resources to feed your army or you simply will not muster more units, you need to control lands that provide you with political power or you will not sit in the throne!! Some times you and your enemys will have to join forces to fight back the dangers behind the great wall, but doing so might left you with little power to fight for the throne..
And the more information you control, more the scales of power can bend to your will…. But alway look to your back… for there is someone just waiting for you to make a mistake!! Fantastic pieces, fantastic art, fantastic game… a must have no doubt!!! – The combat mechanic is luck-free, but still unpredictable thanks to House Cards and Support options. – Facilitates lots of heated player interaction. – Captures the theme perfectly. Not by bombarding you with flavor text, but by setting up the map and factions in a way that encourages games to play out much how they did in the source material. – One of the most balanced games I’ve ever played. – If you don’t have exactly 6 people to play, don’t even bother. It becomes unbalanced and broken with less. This is a completely engrossing gaming experience. This is a LONG game, but you feel engaged for every minute of it. You really do need 6 players to get the full experience, but if you can get that number you’ll find, what I consider to be, the perfect strategy gaming experience. I just love this game. I wish I could convince my more casual gaming friends to play- it always seems to be the one that they feel “sort of” excited about, but when I start unpacking the box, I can see their eyes just sort of glaze over. There’s just so much to keep track of. I love it. If you enjoy games that require you to keep a lot of plates spinning simultaneously, please check this one out. It could use a bit more variety in the event decks, but there are just a ton of different game-play experiences to be had here, playing as different families and with different setups. This iteration of the Game of Thrones combines the major elements of multiple expansions from the first version. The game combines bidding, tactical battle, and a significant amount of player politicking. Houses (factions players control) are very balanced, but a combination of board placement and cards give them a flavor clearly tying them to their book counterparts. A fun, well put together game. Complicated and delightful to play. Play with the expansion, it does take a bit of pain out of getting the right moves made immediately. It’s not my favorite, though I’ve upgraded my opinion to neutral. I say this, though I’m in the minority. Everyone else in my group loves this game. The key here, is to playing a faction that best represents your playing style or it’s a quick uphill battle to remain the least bit relevant. You have commanders that represent your action. You have units you move. There are three other meters to track, all of which are also important. Everything has to be perfectly managed. If one is off or mismanaged at all, you’re in trouble. I would enjoy this game more, if there were more armies to use. I don’t generally play that aggressive in a wartime game, but in this one I would if I had any armies. I don’t follow the series, the group does and they seem to say it’s accurate. Quicker end of gameplay I would estimate. You have to manage everything. If one is off or mismanaged slightly, you’re in a world of hurt. Can’t do much with combat, due to limited armies. A lot of people I talk to enjoy this game, so I’m sure I’m in the minority here. If you are on the fence, talk to someone who owns it already or play it at the game shop a couple of times. This is a solid game. The largest rub I have with this title is that battles, with a bit of math, can be forecast pretty accurately. Do the hidden order markers help mitigate this? Partially, but on any given turn for each player, there are clear “best option” moves. This is especially true once the first shot is fired and the blood starts flowing. Do the house cards add a bit of the unknown to a battle? They do, mostly in the vein of an “after battle is resolved” venue. The swing any given card will give to a battle number wise is (if memory serves) 5. So the basic equation is your units vs my units + or minus potential support tokens + or – 5 will give you a pretty close estimate of best and worst case scenario you will be facing. Also, knowing which house cards each player has spent adds to the predictability of battle outcomes. Again, good game, great components, fantastic flavor but for me the battle system is a bit too predictable. Fantastic game if you are playing with the right people. My friends who I play quite a few war games with loved it, but my wife did not and became very frustrated as the game progressed. Not much of a fan of versus games but I liked this one. 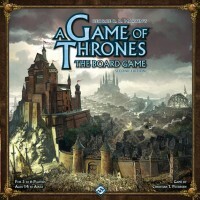 Add a Review for "A Game of Thrones: The Board Game (2ed)"